The Easter celebrations begin on Palm Sunday, the Sunday before Easter. Palm Sunday will be the 9th of April this year. Celebrate at 9:30 with a special Mass in St. Peter’s Square. The fair is free, but you have to get a ticket first. There is only standing room and the fair is expected to attract huge crowds. Since palm fronds are not so easy to find in Italy, olive branches are blessed and distributed. At 9.30, the Pope holds another Easter Mass. In contrast to the Sunday mass, the masses of man hold themselves here within limits. At another Mass, most of which takes place in St. Peter’s Basilica, the Pope washes the feet of several priests to depict the foot washing of the apostles during the Last Supper. On Good Friday, there will be an afternoon service in St. Peter’s Basilica where you can sing, pray and kiss the cross before you receive the sacrament. There is also the Stations of the Cross, where the Pope traditionally treads the Way of the Cross on the Colosseum. Starting from the Coliseum, the Pope and dozens of bishops, priests and other servants carry the public up the Palatine by candlelight, stopping at each station to commemorate the Passion of Christ. An interesting and absolutely unique experience, even for ordinary tourists: since the 18th century, the Colosseum has been the starting point for Rome’s Stations of the Cross. The Saturday Mass will take place in the late evening in the whole of Rome as a kind of vigil for the resurrection of Christ on Sunday. Here adults who convert to Catholicism are baptized and received into the church. The big day is here and the city is full of celebrations! The morning Mass is celebrated at 10:15 am in St. Peter’s Square, but it is best to arrive earlier to secure a good seat. This year’s Easter Sunday falls on the 16th of April. Banks, offices and many shops and restaurants are closed for several days during Easter Week. Especially on Easter Sunday and Easter Monday, almost everything in the city is closed. Pasquetta, the day after Easter, is a national holiday. Many Italians use the day off to enjoy the beautiful spring weather during a picnic or while cooking with friends. As the Italian proverb says: „Natale con i tuoi, Pasqua con chi vuoi“, which means „Christmas with the family, Easter with friends“. 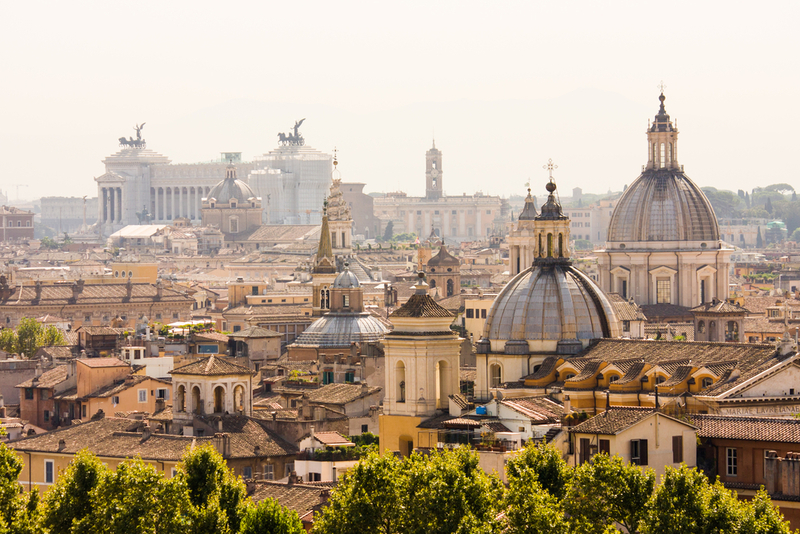 Plan your stay in Rome well over Easter, research which restaurants are open and reserve a table especially for Easter Sunday and Easter Monday! Even though there is not much of the hustle and bustle going on over Easter and many shops are closed, there is nothing more exciting than to take part in the festive holiday mood. With a 1GB data packet , you stay connected in Italy and save up to 95% on data roaming charges. With TravelSim incoming calls and SMS are free in Italy. If you do not have a TravelSim SIM card yet, you can order one here in a few moments. Author: Gina Musso. Gina Musso is American and lives in Monza, Italy, where she teaches in a primary school and writes about travel, culture and food in Italy. If you want to read more of her visit her website, From Italy, With Love.